Over 280 delegates attended the two-day conference held from 29 to 30 November in Bristol, organised by the National Co-ordinating Centre for Public Engagement (NCCPE). From Engagement to Responsibility in Research and Innovation was the title of the RRI workshop. The one-hour session provided an introduction to the concept of RRI and what it means in practice. Delegates had an opportunity to explore the RRI Toolkit as well as discuss the opportunities and challenges of incorporating RRI into their own work. “Our workshop was well-received by participants and a good opportunity to promote RRI and the RRI Toolkit,” said Professor Steve Miller from UCL, who ran the workshop together with Helen Garrison, Project & Communications Manager at VA. Both organisations are partners in the European RRI Tools project. RRI was a concept that many of participants had heard of but were keen to find out more about, as well as learn how it could be incorporated and promoted within their own institutions. They were particularly impressed by the breadth of information and guidance in the RRI Toolkit with many identifying resources that they would be able to use in their work, such as training materials, self-reflection tools and inspiring practices. With the RRI Tools project coming to an end in 2016, there was also concern that momentum would be lost. This provided an opportunity to highlight a number of other and new RRI projects, such as the European NUCLEUS project, which will continue to build upon the work undertaken by RRI Tools. Other topics explored during the Engage conference included community partnerships, evaluation and impact; school partnership sustainability; engaging with underserved audiences as well as future challenges. The winners of the 2016 Engage competition run by NCCPE were also announced at an evening awards ceremony. The Engage competition recognises initiatives that demonstrate excellence in public engagement practice. 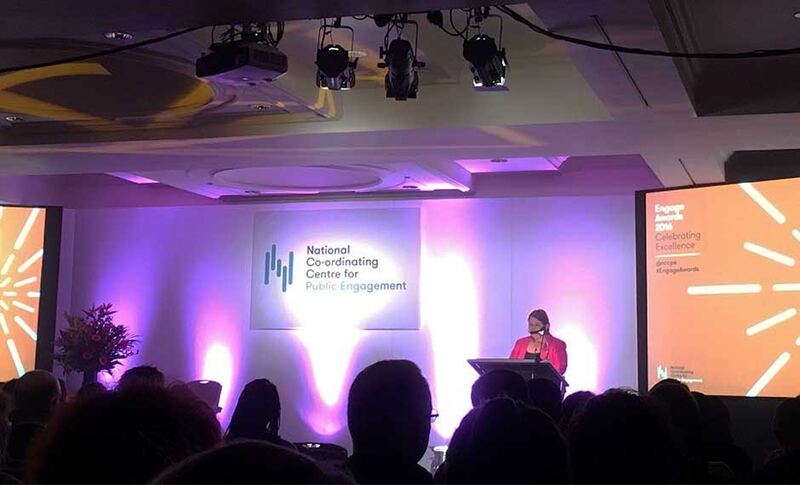 “The conference was a good opportunity to find out more about what is happening in public engagement in the UK, get inspiration from lots of interesting initiatives and make new contacts,” said Helen Garrison.